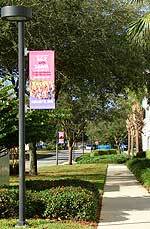 Banner welcomes breast cancer marathon runners to the Florida campus. More than 7,000 runners are expected on Mayo Clinic’s Florida campus Feb. 15 for the second annual 26.2 with Donna, the National Marathon to Fight Breast Cancer. But it’s not just runners who must prepare for a race. When the marathon and half-marathon kick off at 7:30 a.m. that Sunday, it will mark the end of months of preparation by members of Mayo’s marathon committee, who have been working with race organizers and Jacksonville city officials to welcome the runners. This is no simple task, since it involves road closings, accommodating potential ambulance traffic to Mayo’s hospital and getting the word to hospital patients and their families. Although Mayo normally welcomes patients and visitors, this is one time it might be best to stay away, especially from 6 to 9 a.m. Feb. 15. And if you are inconvenienced, please remember it’s all for a good cause. 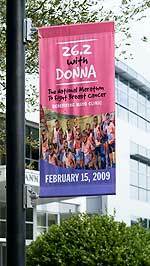 Feb. 15 marks the second time Mayo Clinic's Florida campus hosts the National Marathon to Fight Breast Cancer. Donna Deegan, a Jacksonville television news anchor and Mayo Clinic patient, created the event to raise money for breast cancer research and care. Deegan has survived two recurrences of breast cancer. Race weekend events also include an off-campus Health & Fitness Expo and an educational program on cutting-edge breast cancer research for doctors and scientists.